Underwater fluorescence is beautiful and widespread. It’s not hard to find photogenic subjects and you can come back with lots of striking shots on camera – especially in this digital age. But sometimes there is more of a story behind a photograph. This is one of them. The image here is one of my relatively early photographs, and still one of my favorites. The subject is a beaded anemone, Phymanthus crucifer, that I found on Pedro Bank. I have seen many of these anemones in varied locations, but this one was by far the most beautiful. While most fluoresce a single color this one exhibited intense oranges and yellows, with patches of green. Pedro Bank is a large area of sand and coral located about 80 km south-southwest of Jamaica. It rises out of the surrounding deep waters of the Caribbean and is dotted with a series of small islets. Its position in the middle of what seems to be open sea with no high points of land to mark it has made it a death trap for ships through the centuries. Among the vessels lost on the Bank were a number of vessels carrying treasure back to Spain from the New World. One rich wreck in particular, the Nuestra Señora del Carmen (commonly called Genovesa), made this area the target of both treasure hunters and marine archaeologists. I was previously involved in marine archaeology, and in January 1987 I attended an underwater archaeology conference in Savannah, Georgia. A friend of mine, Jim Parrent, was there recruiting divers to help excavate a wreck that some thought was the Genovesa, which sank in 1730, but that others thought was one of four vessels that sailed and wrecked together during a storm in 1689. Treasure hunters were seriously interested in the Genovesa, but less so in the others, and the government of Jamaica wanted archaeologists to get in there first. Jim needed divers, and I needed access to night diving around corals. I was still in the early stages of developing my equipment for underwater fluorescence search and photography, and I was looking for opportunities to get into the field, especially on someone else’s money. I quickly agreed to join the expedition on the condition that Jim would guarantee that someone on the team would be my night diving buddy any time I wanted it. The deal was struck, and that May I flew to Miami to board the M/V Morning Watch for the transit to Jamaica and then on to Pedro Bank. We set up on the Bank, living on Morning Watch in the shelter of a protecting shoal, and commuting to a work boat moored directly over the wreck site on the exposed side of the reef. What had seemed like a nice working arrangement over a beer in Savannah turned into an ordeal that required a serious act of will to complete. We were putting in close to 8 hour days excavating underwater. It was shallow water, so each dive lasted 1 – 2 hours depending on how hard we were working. As for me, I was spending all day every day swinging a small sledgehammer (you try that underwater!) to dig a wooden chest containing metal (treasure??! ), which we had located with the help of a metal detector, out of the ballast pile. Over the centuries the sand between the ballast stones had completely hardened like concrete and the stones had to be chipped out one at a time. As these long days of hard work went by it became harder and harder to motivate myself to get into the water once again at night, and after the other divers’ initial enthusiasm and curiosity wore off it also grew more difficult for Jim to get someone into the water with me. All told we were diving for 19 straight days and during that time I made 77 dives, 11 of them at night. So that’s how it came about that I was swimming back to Morning Watch one night after a successful photography dive. And there it was, stopping me in my tracks – absolutely the most spectacularly fluorescent specimen I had ever seen, and still to this day it has hardly ever been equaled, much less surpassed. But this was 1987, cameras were not digital, and of course I was only on my way back because I was out of film. I was far enough from the vessel that I knew I would never be able to navigate back to this exact spot. It was also getting near the end of our time on the Bank. So I did what anyone would do in this situation – I picked up the rock that the anemone was attached to and carried it with me, depositing it in the sand below Morning Watch’s stern. I jumped in quickly during the next day’s lunch break to be sure the anemone was still in good shape. That night I eagerly dropped into the water, went straight to the spot, and prepared to start taking pictures. The anemone was just as spectacular as it had been the night before, fully open with tentacles extended. Then things went wrong. Anyone who dives at night knows that very often small animals (zooplankton – copepods) are attracted to your lights. I was on the bottom at about 8 meters and as I was setting up a cloud of these little critters was soon swarming around my light. Just as I was ready to start shooting I made the mistake of sweeping my beam, and its accompanying cloud of tasty morsels, low over the anemone. It proceeded to use it stinging cells (nematocysts) to capture what had to be the best meal it had ever had in its life. Its surface was covered with squirming prey, and the anemone promptly closed up completely to start transferring food to its mouth. 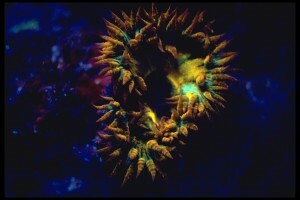 The outside of the anemone was not particularly fluorescent so there was nothing for me to shoot! Only one thing to do. I moved back a few feet, turned off my light, and waited patiently on the sand, watching the anemone in the moonlight. It would open a little, wave some tentacles around, and close up again. Whenever it looked like it might be open enough to get a shot I would quickly move in and fire off a few flashes. I needed light to work with, though, and my effort would lead to the little guy getting even more food and closing up again. This went on for over an hour before I finally ran out of film. Of the 36 shots I took, only the one you see here was worth showing. Enjoy. By the way, the wreck site we were working on turned out to be one of the four vessels lost in 1689, and the ‘treasure’ chest I spent so much time digging out of the ballast turned out to be full of nails. But I did have the thrill of finding the first silver coin that we found on the site, helping to pin down the shipwreck date. It was under the chest of nails.